There are only three Yangtze giant softshell turtles left on the world. One is a male at a zoo in China. The other two, of unknown genders, live in the wild in Vietnam. 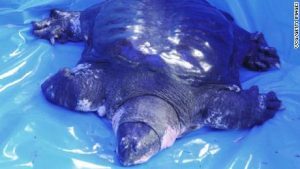 The last known female died in the Suzhou Zoo this week, 24 hours after international experts tried to artificially inseminate her, CNN reports. The turtle, along with her male breeding partner, was believed to be around 100 years old. The Yangtze is the world’s largest freshwater turtle species. The Wildlife Conservations Society says the species has been killed off due to habitat destruction and hunting.